So, you've always wanted to learn how to build an atomic bomb? You're in luck: Jim Ottaviani is not only a comics writer...he also has a master's degree in nuclear engineering! But even though it's not a complete do-it-yourself manual (assembly required, and plutonium is definitely not included), Fallout will bring you up to speed on the science and politics of the first nuclear gadgets. 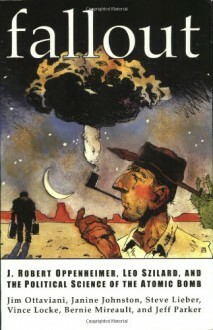 Like its companion volumes, the focus of Fallout is on the scientists themselves -- in particular J. Robert Oppenheimer and Leo Szilard, whose lives offer a cautionary tale about the uneasy alliance between the military, the government, and the beginnings of "big science."